Experience comfort and stability like you never have before with the power wheelchair Permobil m3 Corpus. Its precision engineering allows users to enjoy and maintain better positioning, feel more secure, and experience less driving fatigue with all an all around improved drive performance. customers the best in mobility equipments. This is why we work alongside leading brands, such as Permobil, to provide customers with some of the most capable equipment in the market. Innovative technology allows the Permobil m3 Corpus to deliver a more consistent driving experience for all users even under low speeds, tight areas, or while using a variety of alternative drive controls. The revolutionary engineering behind the power wheelchair Permobil m3 Corpus allows users to explore their environments comfortably and safely, by accessing them in any level due to a 12” of seat elevation and 20º ActiveReach Technology that maintains suspension at any elevation, seating positioning, or driving speed. This all makes the m3 Corpus highly stable, all thanks to its patent pending FlexLink Suspension for advanced vibration reduction, meaning users don’t ever have to sacrifice comfort for function. Its 7” caster design and adjustment-free flutter dampening device lets users move comfortably at lower speeds and even in tight areas. This allows them to turn either way and enjoy greater access to their environment due to a full caster clearance that works at a 90º leg rest position. 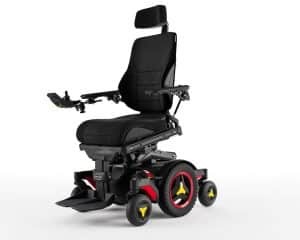 As the mobility experts that we are, we are proud to offer mobility solutions, such as the power wheelchair Permobil m3 Corpus. With its revolutionary technology and features, users can now experience a greater independence, comfort, and accessibility, that prove it was built with the user in mind. Contact Orthopedic Service Company today to learn more about the m3 Corpus power wheelchair and let us help you in the search of the perfect fit for your daily life.